I ran across this old photo of my dad and me dating from 1966 or 1967. 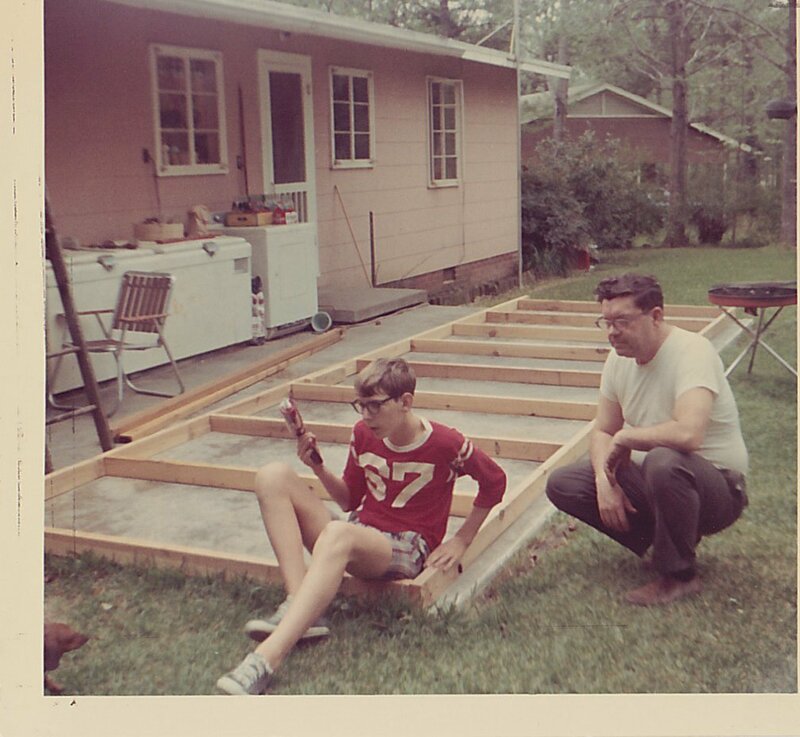 We were building the screen porch off the back of our house, one of my favorite places once it was done, and where I learned to love that weird light that came through those green fiberglass panels that were so prevalent then. I was 12 or 13 at the time, and I don’t remember how much of the work I did, although I do remember helping to put up the walls. But as I looked at the photo, I realized it captured life in the mid-60s in several ways. It starts with the screen door. Every house I knew of had screen doors, because the one thing they didn’t have was air conditioning. I don’t remember ever being miserably hot, and in fact I have great memories of laying in bed while the attic fan pulled in the night air through open windows. But this was Mississippi, and it was hot and humid in June, July, and August (and May and September, truth be known), so I guess it was a case of not knowing how much better it could have been. To the right of the screen door, in fact to the right of the windows, is a pole anchored to the house. This was our external television antenna, because another thing we didn’t have was cable TV. We wouldn’t get that for another 10 years. At that time, we got two channels – NBC (channel 3) and CBS (channel 12). The NBC station, I think, also carried some ABC programming, which is why, I think, we didn’t get Startrek when it originally aired. On rare occasions, we would be able to pull in channel 10, from somewhere in Arkansas, but the picture was never good. A little more subtle is the dryer, right outside the kitchen door. There wasn’t such a thing as a laundry room in any house I knew about – the washing machine was in the kitchen, and there wasn’t any room for a dryer, so when we got one it went outside. But not for long, because the screen porch, which covered the entire patio, came along shortly after the dryer. And the pink color of the house is another indication – I don’t recall seeing pink houses after about 1970. But it was a great house to grow up in, even though there were seven of us crammed into that 950 or so square feet (and one bathroom). Oh, and last but not least – dig those low-top Converse tennis shoes! Love the photo. Notice you didn’t mention those shorts you are wearing. Also, who was #67? Is that an Ole Miss tee? I remember my more ‘country’ family still living in homes like you describe well into the late 70’s. Those shorts were too cool to be mentioned. Or something like that. And that was a generic jersey, although it was my absolute favorite football jersey at a time when I loved wearing jerseys. I seem to remember that generic tee shirt/jersey being everywhere in my youth. I always just assumed it was an Ole Miss shirt. Actually the color was less red and more scarlet, although it doesn’t show in the picture well (it’s faded with time). I always thought it looked sorta like a 49ers jersey of the day. Love the photo – for all of the details you point out as well as just the general “texture.” Thanks for sharing! Hi Will, thanks for dropping by!